Strain on the back caused due to lifting heavy weights is one of the major reason for back-pain. Heavy laptop-bags, grocery bags, and suitcases can expose the body to considerable amount of strain and stress. It is advisable to either reduce the weight or distribute it evenly in both the hands and shoulders. Good posture is crucial for avoiding stress and strain and thus healthy functioning of the spine. Slouching or bending on sides must be avoided while standing. Since most of us do desk jobs, it is also important to have a correct sitting posture. Avoid slumping over the desk and always sit in a good quality chair which provides proper support to lower back. It is also necessary to keep your knees a little bit higher than your thighs. Taking small walks in between is also good for straightening the back and avoid back pain. Calcium and vitamin D rich diet is important for avoiding low bone density and osteoporosis. Foods like dairy products, green leafy vegetables and lentils are rich sources of calcium, while vitamin D can be abundantly found in soya milk, oranges, cheese, fish, eggs, and liver. Sunlight exposure for 10 minutes daily helps the body to properly synthesise vitamin D.
Nicotine present in cigarette smoke reduces oxygen carrying capacity of blood thus depriving body cells like that of spine cells and damages them. 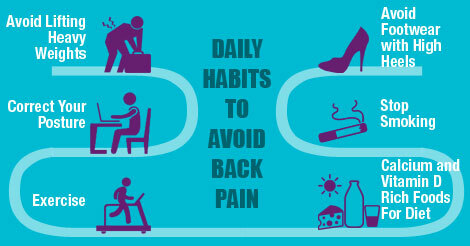 Also, nicotine reduces blood flow to spine and makes it weaker. A weak and damaged spine is more vulnerable to injuries due to stress and strain. Strength and stretching exercise make the back muscles more flexible and stronger. This also allows adequate blood flow to back muscles and bones. All these helps the back to sustain stress and strain better. One must strictly avoid heels of more than 1 inch in order to maintain the health of back muscles and avoid associated pain.